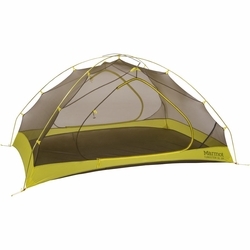 Marmot Tungsten UL 2P Tent. A newly designed tent for the space conscious among us, the Tungsten blends durability, roominess and intuitive livable designs. In fact, it has more space per ounce than any other of our freestanding ultralight tents. Constructed with two large D-shaped doors, two vestibules and a no-stretch Rain Shield polyester fly, this little tent gives the feeling of big living in the woods.